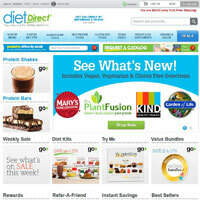 DietDirect.com supports your weight loss by providing low calorie snacks which can be eaten throughout the day. Money saving bundles are available and you can also earn credit by recommending your friends to the website. It caters for gluten-free and vegan dietary needs, as well as a range of popular weight loss diets. The available foods tend to be snack bars, shakes, pastas and cereals, though you’ll find a greater range available. Bundles offer the best value for money, providing items to eat for each meal, each of which is ready to eat, or requires minimal cooking. This takes the hassle out of dieting by reducing the need to calorie count, write shopping lists and cook recipes. There are plans for women or men, as well as providing high protein foods. The site also provides a little information on vitamins and health, plus a range of supplements to help keep you nourished. If you’re into fresh food, though, this “add water”, “take pills” diet is unlikely to stimulate you. All of the foods appear to be pre-dried and so you’ll need to add fresh fruits and vegetables to create something more appetizing. Consequently, the products from Diet Direct seem most suitable as snacks, with you filling in the gaps with healthy meals of your own creation. Unfortunately, the site doesn’t have many recipes (other than more cereal bars, for example) so you’ll need to look elsewhere to find exciting and healthy foods to cook at home. That’s not the only area where DietDirect feels lacking. The website really doesn’t have any tools to help you monitor your weight, and little in the way of advice. It seems more like a shop for selling diet snacks, than a well conceived, practical weight loss website. There’s also no mention of exercise whatsoever. In addition, community features are non-existent. Prices are relatively low, particularly if you buy a bundle. However, this isn’t a complete solution and the lack of exercise and diet information, or any kind of weight loss tools, isn’t all that inspiring. If you simply want a few tasty diet snacks without spending too much, Diet Direct might be the site for you, but if you’re looking for some support and practical information on how to lose weight, you may wish to look elsewhere.